where modern meets timeless At Unison, we believe summer days are best enjoyed among good company â&#x20AC;&#x201D; and with design that stands the test of time. coast table, juniper chairs + stools. quality, by-hand construction is apparent in the coast natural table — made from solid white oak with a tung oil finish. EMMA PITCHER $74.95 Light Blue or Light Gray. FALCON ENAMELWARE 3 PINT PITCHER $50 White or Black. falcon dinnerware. First manufactured in England in the 1920s, Falcon Enamelware carries with it a timeless appeal for any setting. Its porcelain enamel coating is fused onto heavy-gauge steel to ensure its trademark shine and durability. one table, two ways Desk. Dining table. Why not both? The Kolmar Table doubles down on surface appeal with its versatile size that adapts to compact spaces and urban living. Crafted from pure natural oak, it pairs nicely with our 811 Chairs. Medaillon combines the stunning quality of its porcelain with its everyday versatility, ensuring this will be a dinnerware collection you use for years to come. the glassware collection Our tumblers and cylinders take you from every day to special occasions. Relish the small details and know these vessels are crafted to last. our flatware collections take many forms and finishes. in every piece — an expression of quality, beauty and the kind of casual-to-celebratory versatility that unison is known for. Clean and contemporary lines define this collection. Benchmade in North Carolina, the Irving Collection is built from kiln-dried North American hardwoods for the ideal blend of modern design and personal craftsmanship. 5' x 8' $375 / 8' x 11' $875 EDGE PILLOW COVER $48 Teal or Stone. $450 nationwide delivery on orders over $3000 to the continental U.S. Bundle your favorites for noticeable savings onÂ furniture shipping and delivery, and add any other Unison products at no additional shipping cost. Go to unisonhome.com/shipping for more details. holding pattern Good news, pattern fans: We’ve expanded our collection of one-of-a-kind limited-edition throw pillow covers crafted from vintage Moroccan textiles. No two are alike. VINTAGE MOROCCAN THROW PILLOW COLLECTION 12" x 18" $85 / 17" x 17" $109 See the entire one-of-a-kind collection at unisonhome.com. new TURIN BURGUNDY KNIT BLANKET $125 GUNNISON COGNAC LEATHER CHAIR $2699 SAILOR BURGUNDY WALLPAPER $230 Double Roll. a. HASAMI PLANTER SET Small $37 / Large $61 Black, Gloss Gray new Gloss Blue. c. OBLIQUE PLANTER $100 White, Brick, or Black. Nature calls for a modern habitat. Our planter collection is growing and now includes everything from succulent-ready porcelain pieces to shapely vessels for that bigger foliage fix. We ship via UPS Ground to the continental United States, Alaska, Hawaii, and US Territories. Alternative rates will apply for AK, HI, and US Territories. Please visit our website for more details. Use promo code SUMMER100 Hurry, offer ends 5/19/19 * Excludes furniture and rugs. Cannot be combined with other offers. Not eligible on orders shipped outside of the continental United States. $450 nationwide delivery on orders over $3000 to the continental U.S. Bundle your favorites for noticeable savings on furniture shipping and delivery, and add any other Unison products at no additional shipping cost. Go to unisonhome.com/shipping for more details. Most in-stock orders ship within 1-2 business days. Exclusions apply for certain items, including items marked oversized that are shipped via freight carrier. Standard delivery times to continental United States allow 1-4 business days after ship date; Alaska, Hawaii and US Territories allow 5-7 business days after ship date. Additional shipping surcharges and exclusions may apply for oversized/freight items. Orders placed on weekends or federal holidays will not be processed until the following business day. 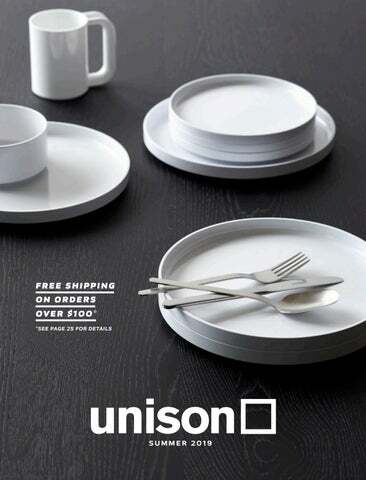 For international orders, please contact us at info@ unisonhome.com or 877.492.7960. We welcome interior designers, architects and business clients with 20% discount on orders. To place your order please contact us at trade@unisonhome.com or 877.492.7960.
oversized items Shipping exceptions and surcharges apply for items marked oversized. Total shipping costs for orders including oversized items will be calculated per package. Expedited delivery is not available for oversized products and shipping restrictions may apply for delivery on weekends and federal holidays. We are unable to ship furniture, rugs or any item considered oversized to Hawaii, Alaska, US Territories, or International. Additional charges may apply to oversize items and special residential circumstances including remote locations not readily accessible. Please contact us at info@unisonhome.com or call 877-492-7960 for more details. White Glove freight delivery is available or required for certain products, as marked. Please contact us at info@unisonhome.com or call 877-492-7960 for more details on White Glove delivery availability. Additional charges may apply to oversize items and special residential circumstances including remote locations not readily accessible. wallpaper collection. Essential for any space, the Unison Wallpaper Collection offers a modern range of our own signature designs. 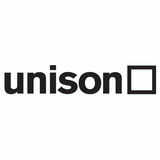 Go to unisonhome.com to see the entire collection, order free swatches and watch our simple step-by-step video on how to hang wallpaper. LOOP RUG 5'7" x 7'9" $299 / 6'6" x 9'8" $425 / 8'3" x 11'6" $599 Black, White, Taupe or Ivory. SASHI GEO SHAG RUG $375 – $1275 | LOOP RUG $299 – $599 Black, White, Taupe or Ivory. TATE GRAPHITE BRAIDED RUG $265 – $985 | MONTAUK RUG $375 – $875 Coal or Cream | WINDSOR BLACK CHAIR $150 See the complete collection at unison home.com. a familiar form, evolved. this modern bench is inspired by traditional spinning wheels, right down to the perfectly aligned spokes. the spindle collection. The inspiration is pre-Industrial Revolution. But the appeal is here and now. Our latest collection takes cues from the spinning wheel, with the added grace of rounded edges and slightly tapered legs. The result is a new classic in every sense. Available in Walnut and Oak. grid bedding. Fresh, clean and orderly. Check all the boxes with our Grid Bedding. The large-scale black-and-white pattern has long had a fan following and also translates to a knit blanket, throw pillow cover, and serving tray. Bedding is graced with a calming, symmetrical sprinkling of white and pewter flecks. This modern bedding is 100% cotton percale, made in Portugal and Oeko-Tex certified. The duvet cover is reversible, so you can flip from pewter to white and back again. ELSTON GRAPHITE BED Queen Bed $1500 / King Bed $1750 The upholstered bed collection is made-to-order. Please allow 3–5 weeks for delivery. Go to unisonhome.com for more details. sashi geo bedding. You’ll know you’re slipping into comfort and won’t want to leave your bed. In cool gray or rich navy, our Sashi Geo pattern is strong enough to hold its own with all your bedding layers, yet all at once subtle, clean, and easy going. A perfectly modern choice for your most mellow hours of the day. tatami bedding + hoyne furniture collection. With a nod to Japanese simplicity, Tatami Bedding helps you find that place of peace. The Unison classic is paired with our Hoyne Furniture Collection, loved for its solid oak construction and Scandinavian-inspired clean lines. fulton bedroom collection. The Fulton Collection combines handcrafted details with the clean lines of Scandinavian-inspired modern design. In keeping with that tradition’s emphasis on linking design and nature, Fulton uses solid white oak, with resawn and hand-stitched leather details. channel platform bed + stitch black bedding. The foundation for a good night’s sleep: quality, artisan craftsmanship. It’s apparent in this pine bedframe and headboard that’s sheathed in moody black fabric and etched with channeled detailing. Cozy up with fan-favorite Unison bedding featuring a microprint that’s soothing in its delicate repetition. d. UPHOLSTERED BENCH $475 Lattice Khaki, Stippled Black or Mesh Gray. The upholstered bed and bench collections are made-to-order. Please allow 3 – 5 weeks for delivery. Go to unisonhome.com for more details. TOWER SOAP DISH $15 White or Black. FLOAT SOAP DISH $12 Black or White. TOWER TOOTHBRUSH HOLDER $19 Black or White. BINCHOTAN TOOTHBRUSH $8 Black, Red, or White. FALCON TUMBLERS $10 Black or White. RIN TISSUE CASES $32 White with Ash lid or Black with Walnut lid. WOODROW WASTE BIN $22 White Stain or Black. a. LOGAN TOWELS Washcloth $5 / Hand Towel $15 / Bath Towel $35 Gray or White. b. MILANO GRAY TOWELS Washcloth $6 / Hand Towel $18 / Bath Towel $38 c. MINI GRID BLACK TOWELS Washcloth $6 / Hand Towel $18 / Bath Towel $38 d. DIVISION BATHMAT $44 White or Graphite. TOWER LARGE BASKET $55 White or Black. NARA COAT TREE $95 White or Black. TOWER LAUNDRY HAMPER $58 White or Black. there’s more to these bulb vases than meets the eye ­— remove the top plate and you have a traditional vase.